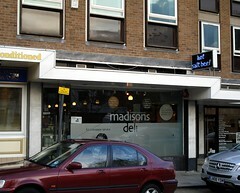 Madison's Deli was a cafe/restaurant just along the road from Stanmore Station, specialising in Jewish food. It has now closed. As of September 2017 the premises are occupied by Delisserie. Cafe/restaurant just along the road from Stanmore Station, specialising in Jewish food. They also offer a full takeaway service, including "assorted platters of cold meats" and "hot falafel". Note though that according to the Jay Rayner review linked below, they're not actually kosher – and despite the name, they're not really a delicatessen. The interior is smart and modern, with a brushed-steel bar, pale polished floorboards, muted grey tables, and a high ceiling with a row of lamps dangling from it on long supports. Kake first visited on a Tuesday afternoon in October 2008. I got there a little after 2:30pm, but although they were due to close at 3pm there was no rush to get me out of there; indeed, they were happy to bring me a second cup of tea at 5 to, and just after they'd done that they gave dessert menus to another party. They did turn the "open" sign over to "closed" bang on time, though. I had a reuben sandwich (£6.50) photo and a couple of cups of tea (£1.50/cup). Of the two bread options offered (white or rye), I chose rye. The sandwich included a generous quantity of decent salt beef (neither too salty nor too fatty), along with the requisite sauerkraut and Swiss cheese. Mustard, which was good and hot as advertised, came on the side. Bread was fairly thin-cut, and the underside of the second half of the sandwich was soggy by the time I got to it, but it all held together well enough. Kake, Kerry, Ewan, and two friends visited again on a Thursday evening in April 2011. We hadn't booked, but there was no problem finding us a table; the place was about half-full. Service was very friendly, and they had no problem with one of us just wanting a drink and nothing to eat. Tea matzos and sliced rye bread were placed on the table shortly after we sat down (there was no charge for this on the bill). We shared a few starters: boiled gefilte fish (£4) photo, fried gefilte fish (£4) photo, and taramasalata (£3). The fried gefilte fish was served cold; we hadn't been expecting this, but apparently it's the usual way. A pungent horseradish-beetroot dip came along with the gefilte fish, and certainly improved it. Kake's main of salt beef and tongue (£11) with a latka (£2) on the side might have looked quite plain photo, but it was very good, with lovely tender meat (even the tongue), and not too salty. It was more than I could finish, but our waitress happily packed the rest up for me to take home, offering this service before I even got around to asking. Accessibility: Small ramp to get in, and step-free once you're in. Last visited by Kake, Kerry, Ewan, and friends, April 2011. Last edited 2017-09-05 06:56:06 (version 9; diff). List all versions. Page last edited 2017-09-05 06:56:06 (version 9).